I don’t think I’ve ever been so blue about the holidays drawing to close as I was this year. Every moment was so precious that I literally watched them pass with a sigh and even a few tears. And when Philip went back to work on Tuesday and I was confronted with a quiet house and a mountain of laundry and a good-sized hill of dead greenery, it was all I could not to crawl back in bed and pull the covers over my head. It’s the price I pay for all my Christmas sentiment, I am well aware, and worth all its sweet pain. But something had to be done. And to my melancholy mind there appeared but one option: we had to throw a party. So we invited our friends to a Twelfth Night Revel. It’s something we’ve wanted to do for ages, but with it falling on Friday this year—coupled with the desperate need I had for festivity—it seemed the very moment in time for such a frolic. 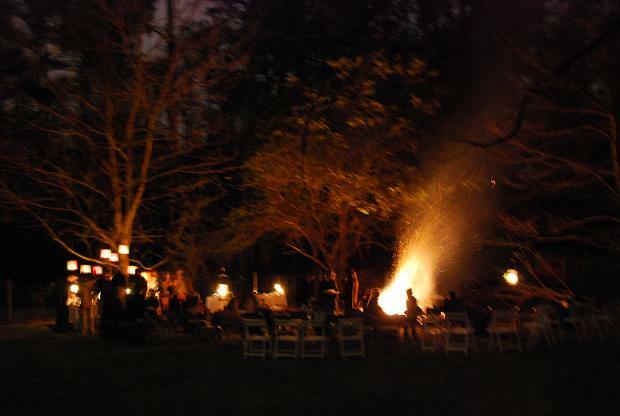 So Philip got the bonfire ready and put out the chairs in a wide arc around it, and I decorated our big copper lanterns with wired-on greenery and doled out food assignments with each RSVP. I set up tables for the pots of chili and the platters of cornbread and the bowls of salad that were coming and spread them with branches of pine and big, ferny sprigs of cedar, interjected by tall glass hurricanes with white tapers. The front hall was cleared for dancing, and the chandelier was woven with a wreath of ivy and strung with bright crepe paper, red and green, that extended in winding ribbons to the four corners of the room. I made an enormous pan of Mexican cornbread and a pot of my favorite ‘White Christmas chili’ and took the remaining cookies I had made out of the freezer. And all through the preparations the day of the party I listened to the thunder rumble and watched the rain falling outside—a veritable monsoon—and fielded phone calls from anxious friends. Comes dancing along with a cup and a song to drive the cold winter away. As twilight fell the world only became more glamorous: the mist rolled up along the terraces in the pasture and crept over the lawn, and stars winked out in the velvet overhead. “I feel like we’re in Merry Olde England!” I cried to Philip. There certainly was great merry-making around the fire that night. Sparklers for the children and bottle rockets and Roman candles for the boys and men. Old English games like ‘Christmas Candle’ and ‘Snapdragon’ that Philip and I dug out of an old book. Mirth and good cheer as Christmas trees were added to the blaze sending the flames a good forty feet into the air. After seconds and thirds of dinner had been dispensed with, my friend Rachel and I gathered all of the little girls for a special procession of the wassail and the Twelfth Night cake—which had been duly prepared with the traditional bean, pea and clove planted somewhere in its spiced depths, the discovery of which would determine the king, queen and knave, respectively, for the evening. We rehearsed our wassailing song quietly in the shadows of the great walnut tree and lit green sparklers on the cake before making our solemn way across the backyard down to the fire. And here we come a-wand’ring so fair to be seen! Coffee and wassail and cookies in the house after that for the hearty and hale that had stayed for the dancing. Postie’s Jig and Corn Rigs and Frost and Snow were executed with commendable good spirit, despite—or, perhaps, because of—the fact that for the first time ever we had more gentlemen than ladies and a couple of un-named guys had to cross the set and dance as girls! The candles wavered in their sconces as we romped by and the crepe paper fluttered overhead. And when we were all too tired to dance anymore, we flopped on the floor, the stairs, the remaining seats, and smiled sleepily at one another. But despite my weariness, when we said goodbye and closed the door for the last time, I turned to Philip with a look of elation. My Christmas was complete; my holiday wrapped up like a present from God in one last lovely memory. We had said a worthy farewell to the dearest season of the year, toasted its memory with our laughter and songs. And it’s only forty-six more weeks till I can start decking my halls again! Happy 12th Night, Dear Ones! Fantastic photos. It would be a treat to attend one of these celebrations! Lanier, your Advent and Christmastide posts have been excellent. They have inspired me to make more of the season in my own small way. Long have I admired the faith and the aesthetic sensibility expressed on this site. I live across town from you–D__, to be precise. I am also a Christian, a homemaker, an Anglophile, a tea-drinker, a gardener, and a reader. I would love to correspond with you. Please e-mail me if you have the time to spare. Hope you and Philip have a joyous Epiphany. What a wonderful evening! You’ve inspired me to plan one for next year! Happiest of New Years to you, Lanier! I’ve basked in your Christmas-time posts. Your love of the season is beautiful. Your words of description are also beautiful. Is there anything more magical than bonfires, candles, fireworks…lights at night? What a fitting way to end this season! I confess that I’m…hmm…do I really want to confess?…well, a little GLAD that everyone I know ends Christmas at New Year’s or even on December 26th, because then I can quietly, intimately, dearly spend some time alone with Jesus during the last half of the Twelve Days, and rest. When there’s even one gift that has to be wrapped or shipped after December 25th, I just about collapse; I’ve learned to plan carefully against that. But you seem to have endless energy! Because of my habit of crashing after the 25th, it almost exhausts me to read this. But it’s lovely just the same. What is 12th Night? I’ve never heard of it before. It sounds like a lovely celebration.